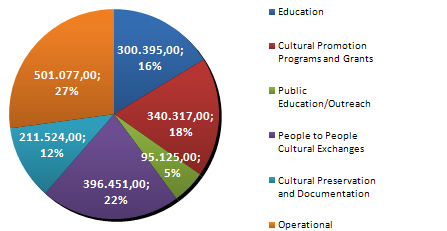 In 2009, the Turkish Cultural Foundation allocated a total of $ 1.844.889 in grants and direct disbursements to pursue its mission. The following chart provides an overview on how TCF funds were allocated in 2009. For a full listing of all Foundation grants please visit the TCF website. The Turkish Cultural Foundation continued supporting schools by the Turkish American community that offer weekend education to Turkish American children. Grants were provided to support the schools of the Turkish American Association of Northe Texas, the Turkish American Association of Central Ohio and the Turkish American Association of North Carolina. In its second year, the Turkish Cultural Foundation’s Fellowship in Turkish Culture and Art was awarded to 13 scholars. The program aims to provide support to students, researchers and scholars who conduct research and publish on the art and culture of Turkey, with a special emphasis on studies related to the preservation of Turkey’s artistic and cultural heritage. The mission of the Turkish Cultural Foundation Fellowship Program is to recognize and assist scholars, whose academic achievements and research reflect the commitment of the Turkish Cultural Foundation to disseminating knowledge about Turkey’s cultural heritage. Since the Fellowship program was established in 2008, a total of 11 post-doctorate and 12 Ph.D. dissertation fellowships were awarded by the Turkish Cultural Foundation. Supporting the promotion of Turkish cinema in the United States remained on the cultural agenda of the Turkish Cultural Foundation. The Foundation supported the screening of Turkish films at Filmfest DC, and through its partnership with the Moon and Stars Project in New York, acclaimed Turkish films were screened at Turkish film festivals in New York, Madison, Milwaukee and Seattle. To further the Turkish Cultural Foundation’s goal of showcasing Turkish artists for inteational audiences, the Turkish Cultural Foundation provided funding for Turkish artists to perform, take up residencies and participate in inteational fairs and conferences. TCF underwrote the participation Dr. Ilgim Veryeri-Alaca, a painter and educator, at the Transcultural Exchanges conference in Boston to provide a lecture on inteational artist residencies in Turkey. TCF also sponsored a residency for Turkish artist Emre Huner at Apexart in New York. In line with the Turkish Cultural Foundation’s commitment to support research and education about Turkish art and culture, the Foundation underwrote a multi-year research project by its Senior Scholar in Residence, Prof. Dr. Nurhan Atasoy. Prof. Atasoy’s research for her upcoming publication “Turkish Culture in Europe” took her to museums, castles, mansions and libraries across Europe. The Foundation also provided support to lectures on Turkish carpets, textiles and art by Dr. Sumiyo Okumura, Resident Art Historian at TCF, in the US and Japan. As part of the Foundation’s mission to preserve and enhance Turkish art forms, the Foundation has provided a major grant to glass artist Gulin Algul in support of her ongoing work to improve the application of marbling – ebru, traditionally used on paper, to glass. The Foundation’s "Who’s Who in Turkish Art and Culture" online database of artists, artisans and scholars in Turkish art and culture reached over 1000 entries in 2009. Under development by Dr. Sumiyo Okumura, this online database, accessible on our Turkish Culture Portal, aims to help promote Turkish artists worldwide, while making it easy for people of common cultural interests to find each other and collaborate on projects that celebrate Turkish cultural heritage. In 2009, TCF also inaugurated Turkish Culture Shop, an initiative to promote Turkey’s diverse cultural and artistic products and a sampling of Turkish food items. Turkish Culture Shop helps to promote and support artists and manufacturers of fine Turkish products, while providing interested buyers access to products which comply with the high standards of the Turkish Cultural Foundation. All profits benefit the work of the Foundation. TCF continued its widely acclaimed educational program in cooperation with the World Affairs Councils of America (WACA) on a nation-wide scale, joining hands with 14 local World Affairs Council chapters in 2009. In its third year, this collaboration created a nationwide educational outreach program focusing on teacher education on Turkey, as well as a program on Turkey for the general public with the aim to enhance general understanding about Turkish society, culture and history. As part of this program, 14 participating World Affairs Councils around the United States organized teachers’ workshops on Turkey with the participation of 626 teachers. The Foundation also collaborated with the World Affairs Councils in selecting 83 teachers for the teachers’ study tours to Turkey (see below) and organized a series of public educational programs entitled “Portrait of Turkey”. Since the beginning of this joint TCF-WACA program in 2007, a total of 1449 American teachers have participated in the teachers' workshops on Turkey, while the public programs organized with the help of returning teachers have reached thousands of Americans through cultural events ranging from book club readings to cultural displays. Providing support to Turkish American community-based media with a goal to increase communication in the Turkish American community and promote Turkey, the Turkish Cultural Foundation continued to support the “Turkish American Hour" on Fairfax (Virginia) Public Access TV channel and “Bonbon” , a magazine for Turkish American children produced in Washington, DC. Since its first cultural tour in 2006, the Turkish Cultural Foundation has hosted 108 Americans from different walks of life on cultural tours to Turkey. The fifth Cultural Tour took place in fall 2009, hosting 30 influential Americans from govement, business groups, academia and non-profit organizations on an exclusive cultural jouey through Turkey. Throughout this program, participants received an in-depth exposure to the historical, cultural and natural beauties of Turkey. The Turkish Cultural Foundation also provided special programs and expertise to many professional and educational groups visiting Turkey, including for participants in the 1st Women Entrepreneurship and Leadership Summit organized in Istanbul. For a second year, the Turkish Cultural Foundation provided a major matching grant to the Global Heritage Fund, to combine efforts in support of the excavation and preservation project at the ancient archeological site of Catalhoyuk. A Neolithic site in Central Turkey, Catalhoyuk dates back some 9000 years. The site is home to the world’s earliest mural art and is central to our understanding about the origins of civilization. Just as the Foundation supports new artistic work by living Turkish artists, it also nurtures Turkish musicians in situ. In 2009, the Turkish Cultural Foundation continued providing grants for one of the oldest musical societies in Istanbul, the Eyup Music Foundation, to expand their facilities to teach young children and adults Turkish classical music in the lower income neighborhood of Eyup in historical Istanbul. Contributing to the successful transmission of Turkey’s unique musical heritage to the next generation, TCF continued to support research and documentation on Turkish music. A grant has been awarded to Turkish ethnomusicologist Dr. Melih Duygulu, coordinator of the Turkish Music Portal of TCF, for the collection of materials and a multi-discipline field research with a view to produce a Turkish Folk Music Dictionary. The Foundation also sponsored a leading art gallery in Ankara. The TCF grant allowed Gallery Nev to catalogue its vast archive on mode art, as well as to create a space within the gallery for their research. The archive consists of resources for comparative studies of art, modeity and modeism of different cultures, including handwritten letters by late artists, rare books and prints, essays and clippings from foreign newspapers and art jouals, catalogues of inteational exhibitions, as well as professional images of art works hidden from the public eye in private collections for scholars, students and the public at large. In 2009, the Turkish Cultural Foundation inaugurated an online Image Archive of Turkish Art with around 12,000 digitalized slides pertaining to Turkish art. The Archive was created from the professional collection of Prof. Dr. Nurhan Atasoy, Art Historian and Senior Scholar of the Turkish Cultural Foundation. It contains images of artifacts from museums, art institutions and private collections take by Dr. Atasoy throughout her professional career and date back to 1955. The Image Archive of Turkish Art is accessible to students, scholars and researchers worldwide and is an invaluable resource for anyone with an interest to research Turkish art. The Turkish Cultural Foundation operates from offices in Boston, Washington, DC, Istanbul and newly opened Detroit and Sonoma locations with a growing team of professionals, intes and volunteers, who implement the mission and undertake the inteational work of the Turkish Cultural Foundation.